1 Day -01 to 07 (25-05-2018 to 31-05-2018) : Finalizing operational mechanism based on the G.O.Ms.No. Finance (HRM-I) Department, Dated:24-05-2018 by the concerned departments, in consultation with the Unions / Associations. 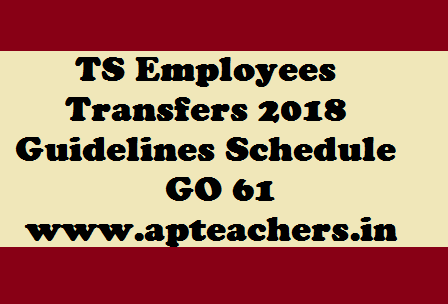 2 Day – 08 to12 (01-06-2018 to 05-06-2018) : Submission of applications with option by the employees. 3 Day–13 to19 (06-06-2018 to 12-06-2018) : Verification of Applications and arranging, as per transfer policy and preparation of master list accordingly after counseling. 4 Day 20 to 22 (13-06-2018 to 15-06-2018) : Issue of transfer orders, and 3rd day of issue of orders employees shall be deemed to have been relieved from the previous station.